Fibres: Fibres are the components of the threads that are woven together to create a woven wrap. Lots of different fibre types can be used in wraps. They are explored more fully below. Blends: Blends are usually comprised two or more fibre types. They can include any number but tri-blend and quads are often popular. Density: This term can describe how thick or thin a wrap feels in hand. Often a thicker density wrap will feel like it offers more support. They can be a little trickier to work with because they are sometimes harder to tighten and have large knots. GSM– GSM means ‘Gram per square metre’ that is the weight of fabric in gram per one square metre. By this we can compare the fabrics in hand- which is heavier and which is lighter. 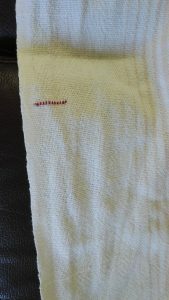 Linen– Linen is reputedly good for adding support to a wrap. They are often popular in warmer climates for their breathable properties. Many linen blend wraps can be tough to break in, but they are worth it. They break in to be buttery soft and usually have a silky soft quality to them. Linen is a strong and supportive fibre and is a great everyday wrap blend. It can be popped in the washing machine and is pretty straight forward to care for. Cotton-There are many different varieties but the most popular is Egyptian Cotton or Combed Cotton. Cotton is a great workhorse fibre and a great first wrap. Cotton is soft, easy to care for and extremely unlikely to irritate the skin. Silk– Silk has low elasticity, so lacks ‘bounce’ and strength when compared to other blends available. It’s also one of the strongest natural fibres, and is very supportive. Wild silk, which includes Tussah silk, is produced from cocoons gathered in the wild and is very labour intensive. Commercial silk is produced from the cocoons of the silkworm pupae. They are especially bred to produce a smoother silk with no mineral deposits on the surface. There are ethical questions surrounding the use of silk so if welfare is high on your agenda then I would ask the question of your favourite brands how their silk is sourced. 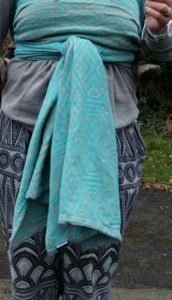 Wool– Merino, Cashmere, Yak and other wool fibres- Wool wraps are warm and soft, perfect for carrying children but they come with a slight complication in the way that they have to be cared for. They need to be very carefully washed and laid flat to dry. Folding them on an airer can cause weight to pull the fabric out of shape. Of course you can’t use a tumble drier as the heat will also cause problems with the fibres. They will very likely become felted. (I talk about felting further down the page). However, wool fibres are an exceptionally popular addition in blends. They are snuggly and soft and often feel beautiful to wear. Yak and wool in general can have a reputation for being ‘prickly’ but it’s worth trying it for yourself to see how you find it. Yak for example is incredibly supportive for heavier babies and toddlers or even pre-schoolers. Bamboo-Bamboo blend wraps are floppy straight off the loom. However, bamboo can feel a little slippery, so may not be the best choice for a novice wrapper. Bamboo is often airy and has a light silky feel to it. Bamboo is breathable, it has insulating properties that will keep you both cool in summer and warm in winter. Bamboo fabric is highly absorbent and is able to take up to three times its weight in water. This is means it pulls moisture away from the skin so that it can evaporate and keeps you cool. Hemp– Wraps made from hemp are slightly smooth and silky with a high natural sheen. They can be cooling too but require careful storage as they can crease easily. Weaves: In a plain weave wrap, the weft thread passes over one warp thread, then under the next, then over, then under, etc. Warp: The warp threads of a wrap are the threads that run lengthwise down the wrap, from tail to tail. 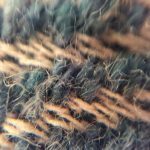 Weft: The weft threads of a wrap are the threads that run widthwise across the wrap, from rail to rail. Also, different weft blend choices can change the wrapping qualities and feel of the wrap as well. So, with different wefts, you can have two wraps of the same warp that are almost entirely different from each other! Loom to Bloom: When a wrap is woven it is done on a loom. Wraps very often arrive ‘loom state’ which means unwashed. The process of washing serves more than just the purpose of cleaning any factory dust out of the cloth. It also provides a chance for the fibres to plump up and become fluffy. This is what is meant by bloom. 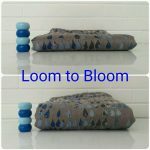 It’s very interesting to see wraps going through the transition from ‘Loom to Bloom’ as a visible difference is clear. Felting: This is the accidental by product of washing in a way that causes too much heat combined with agitation. Temperature changes in the water combined with movement will also cause felting. Unfortunately, once a wrap has become felted it’s no longer safe for carrying babies. Felting can be identified by a creaking noise in the fabric. Uneven widths across the breadth of wrap are also a sign. Pleats: Pleats are the folds that fabric can make on the shoulders when being used for carries. Rails: Rails run along the length of the wrap. They are often called bottom rails and top rails. When we tighten a wrap we want to make sure that we bring out the slack in both the rails and also the whole width of the wrap. Tapers: Most wraps woven by machine will have tapered ends. These can be seen on the photo. Sometimes they can be quite shallow like those shown but they usually are slightly more angled. Very few machine woven wraps have completely blunt ends on them. Ali Dover is one example of a woven wrap that doesn't have tapered ends. Middle Marker: The middle marker as the name suggests is a little identifier that sits in the middle of the length of the wrap. There will usually be two, one on the top rail and one on the bottom rail. Middle markers don't always have to be tags. they can sometimes be 'tactile' meaning something that you would feel like an extra weaved shape or raised threads. A blessing thread middle marker is a clearly identified change of colour in the thread at the middle location. Tails: All of the fabric remaining once a knot has been tied off are referred to as the tails. Some people like to have long tails and others like shorter tails. It’s really down to preference. Long tails can be used as a cover from weather or tucked into a pass. Breaking in/Broken in: When a wrap comes off a loom it is called Loom state. When it gets used a lot it the fibres change and become more mouldable and plumped. This is called being broken in. 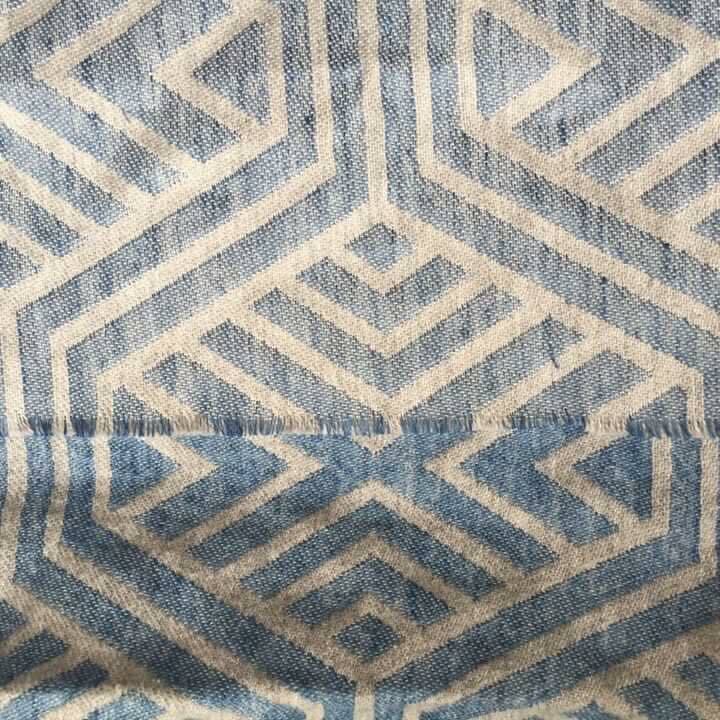 The difference between broken in linen and loom state linen can be seen in this photo. Loom state is above and broken in is below. Colour of linen can really transform as seen in the photo when it deepens and intensifies. Wraps can be broken in by wearing them, running them through sling rings, using them has hammock swings (carefully!) laying on them, sitting on them and depending on the particular blend you can knot them repeatedly too. Perma-creasing: This is something that is particular to some blends more than others like linen or hemp blends. When wraps are stored a permanent crease can form a deep line, usually aligned with with either rail. Thread-shifting: When there is movement in the threads they can wriggle and put themselves out of shape. It is quite common in linen blends and will usually resolve itself with a wash and steam iron or two. Broken thread: Broken threads happen when a snag is pulled to the point of breaking. They can be daunting to fix but it’s important that they are mended otherwise they can spiral into a hole from weight bearing. A hole would deem a woven wrap unsafe for carrying children. A broken thread can be mended with patience and a needle. Both pieces of thread are woven back together and then knotted. The remaining thread is then woven back into the weave of the fabric. Pulls: Pulls are little loops of thread from the weave that often happen when rings or clothing snags the wrap. 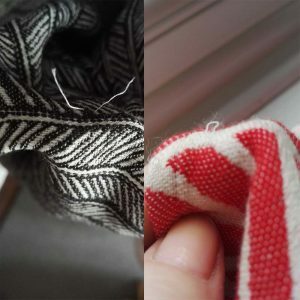 Pulls are part and parcel of using a woven wrap and can be resolved with patience and a blunt needle. Some pulls can be very small and other can be large. They should always be resolved as they are likely to become broken threads if they are left to snag again on something else. Weavers knot: Part way through a weave thread can run out and need to be changed. When this happens the weaver will knot the threads together and resume the weave with the ends of the threads being captured by the weave. The resulting knot that sits atop the weave is called a 'weaver's knot'. 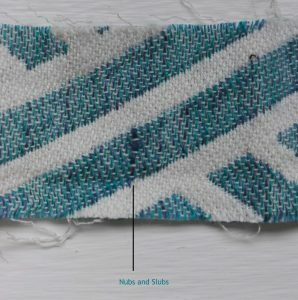 Nubs and slubs- In some fibres, particularly linen and silk there can be nubs and slubs. This is what we call the nobbles and thicker fibres in the wrap. Wraps short/long: When a woven wrap is very dense it might be quite firm in hand and in use it may feel like it wraps shorter. So if you are used to using a size 6 for particular carries and you use something thicker or more firm and you can't quite tie it off comfortably it might be that it wraps short. Conversely, some wraps with a lot of stretch, sometimes referred to as 'bandagey', may stretch out a lot and wrap longer. 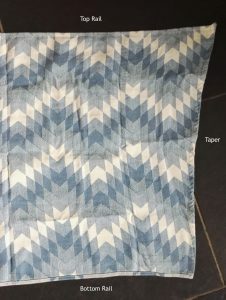 Diagonal Stretch: When you hold a wrap in two hands with one on the corner and one in the middle of the fabric and pull, you can feel the fabric 'stretch'. This is said to be diagonal stretch and can give a clue to how much the wrap might 'give' when it's used. A wrap with very little diagonal stretch won't have much budge but will hold firm and stay in place. 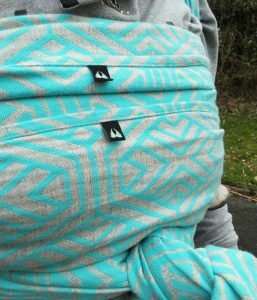 A wrap with more diagonal stretch might stretch out to add some more centimetres, mould to you and your baby's body better and feel snuggly. STIH: Soft tape in hand. When measuring a wrap we use a soft dressmakers measuring tape and this is called STIH. Measuring just one rail starting at one end, keep the tape tight and measure the whole length of that one rail all the way to the other end. This is the technique involved. Knee to knee: Knee-to-knee simply refers to the seat of the carrier extending from the back of baby’s left knee to the back of right knee, fully supporting both thighs. This is ideal for supporting a child’s legs and bottom in a carrier. In a wrap or ring sling, you achieve knee-to-knee support by spreading the fabric as wide as needed.